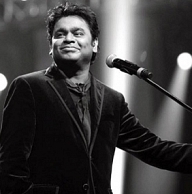 AR Rahman, as we all know, is a master of all genres but there is one genre that his fans are waiting for him to explore. Yes, it's the ‘thara local’ Kuthu genre, even though he has given us some memorable folk numbers like ‘Maanoothu Mandhaiyile’ and ‘Mazhai Thuli Mazhai Thuli’. Here is one happy news for such fans who are eager for Rahman to give a song like Danga Maari or Darling Dambakku. Pravin Mani, a close friend of AR Rahman and the music director of movies like Payanam and Mirattal has shared in his official social forum that he is going to work on a funky Kuthu number with AR Rahman. His message read “time to work on a funky kuthu for ma bro A.R. Rahman..a new surprise proj...wink emoticon”. This for sure sounds exciting but only time will tell whether this number will be a ‘thara local’ Kuthu or an experimental song with all the fancy techno touches on it. People looking for online information on AR Rahman, OK Kanmani, Pravin Mani will find this news story useful.